Nowadays there are a lot of open source libraries that you can use within your projects. They're pretty nice worked and allow you to do a lot of things to know when things happen via events. They allow you normally add a callback to certainly events triggered internally. Have you ever wondered, what's the right and easiest way to built such a library that allows to use callbacks ? Well, whether if this is the right way to do it is not the absolute truth, but a lot of libraries rely on the Event Emitter class of Node.js. In this article you will learn how to use them for both ECMAScript 5 and 6. When EventEmitter.call(this) is executed during the creation of an instance from YourLibrary, it appends properties declared from the EventEmitter constructor to YourLibrary. Then the inherits function inherits the prototype methods from one constructor into another (your constructor YourLibrary and the super constructor EventEmitter), in this way the prototype of your constructor will be set to a new object created from superConstructor. // Outputs: "Hello World, data test"
Although to handle asynchronous events can be a little bit tricky, everything will make sense at the end, so if you don't understand it yet, be patient and analyse the example carefully. // Outputs : Received data: "Hello World, data test"
As you can see, it's pretty easier than handling the same code with ES6. If you didn't get it with the introduction, don't worry, we're sure that handling the example as a library in the real life (or something similar) will help you to understand. In this example, imagine that we are going to use a Download Manager library, this library is really simple, it offers a way to download a file from your server asynchronously. Using the Event Emitters class of Node.js, you are able to know when the download of the file finishes and allows you to know the progress of the download. // Write your library down here by prototyping ! // Use the emit method of the EventEmitter to trigger the downloadSuccess event ! For the example in ES6, we'll use the same idea of the first example in ES5, imagine that we are going to use a Download Manager library, this library is really simple, it offers a way to download a file from your server asynchronously. Using the Event Emitters class of Node.js, you are able to know when the download of the file finishes and allows you to know the progress of the download. 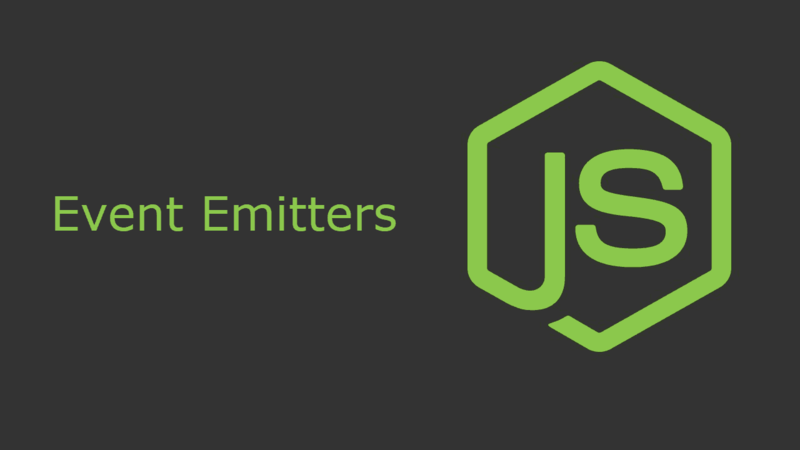 As you are using the EventEmitter class of Node.js you are able to use all the methods of this class in your library, so don't forget to check the docs of Node.js to know more about the Event Emitters.